Device Implementation Is Possible Without the Headache! Acclaim and Credly merged. CSULogics seems CCCS native; pls advise if I need to contact them nevertheless. Badgr is now with Canvas, but I still think we need to explore the options with other LMS, such as D2L. Anchor allows users to record and edit podcast episodes, all through an app on their cellphones. The service distributes and uploads episodes to streaming services, such as Spotify and Apple Podcasts, and provides analytics following publication. Podcasts that require scripts similarly encourage students to explore writing formats that stray from the traditional essay. Last spring, cinematic arts and broadcast journalism teacher Michael Hernandez introduced his 11th and 12th graders to podcasting to teach them speaking skills that could be necessary for upcoming college or job interview. According to the most recent federal statistics from 2016, roughly one out of every three or 6.3 million college students learned online. That number is growing even as fewer people are going to college. The paper, “Does Online Education Live Up to Its Promise? A Look at the Evidence and Implications for Federal Policy,” was also written by Sandy Baum, an economist at the Urban Institute, a nonprofit research organization. Online degrees are also concentrated among a handful of nonprofit universities. 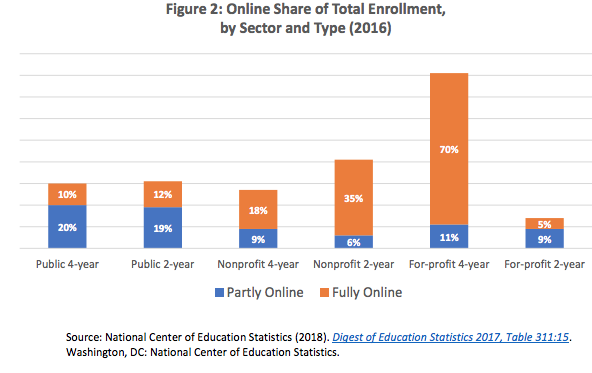 Just three — Western Governors University, Liberty University and Southern New Hampshire University — enroll about a third of all online students at private, nonprofit institutions. Another 2017 study of students at a for-profit university which offers both in-person and online classes found that students who took an online class not only got lower grades in that class but also in future classes. Online students were more likely to drop out of college altogether than similar students who attended in-person classes. There are much stronger results for courses that combine supplemental materials online with traditional, face-to-face instruction. But the authors do not consider this hybrid instruction to be “online” learning. D2L Brightspace course to explore issues related to communicating with our students both outside of and within the classroom, orally and through our documents, policies, and electronic communications and how these impact their sense of belonging. The “course” will use short, asynchronous, interactive activities to help us explore how we can better serve our students, connect across the system, and share resources. 2nd meeting, March 28, 2019. What is universal design for learning? Cognitive load describes the capacity of our brain’s working memory (or WM) to hold and process new pieces of information. We’ve all got a limited amount of working memory, so when we have to handle information in more than one way, our load gets heavier, and progressively more challenging to manage. In a classroom, a student’s cognitive load is greatly affected by the “extraneous” nature of information—in other words, the manner by which information is presented to them (Sweller, 2010). Every teacher instinctively knows there are better—and worse—ways to present information. A study in Australia in the late 1990s (the 1999 Kalyuga study) compared the learning achievement of a group of college students who watched an educator’s presentation involving a visual text element and an audio text element (meaning there were words on a screen while the teacher also talked) with those who only listened to a lecture, minus the pesky PowerPoint slides. It’s called the the redundancy effect. Verbal redundancy “arises from the concurrent presentation of text and verbatim speech,” increasing the risk of overloading working memory capacity—and so may have a negative effect on learning. a separate Australian investigation by Leslie et al. (2012), suggest that mixing visual cues with auditory explanations (in math and science classrooms, in particular) are essential and effective. In the Leslie study, a group of 4th grade students who knew nothing about magnetism and light learned significantly more when presented with both images and a teacher’s explanation than a separate group which received only auditory explanation. Limit yourself to one word per slide. If you’re defining words, try putting up the vocabulary word and an associated set of images—then challenge students to deduce the definition. Honor the “personalization principle,” which essentially says that engaging learners by delivering content in a conversational tone will increase learning. For example, Richard Mayer suggests using lots of “I’s” and “you’s” in your text, as students typically relate better to more informal language. Our work with Chinese students from the Confucius Institute (CI) at St. Cloud State University (SCSU) shed light on an interesting development: in the last several years, the popular Chinese social media platform WeChat dominates the social life of Chinese people, Chinese students in particular. WeChat, like WhatsApp in Europe, Vkontakte in Russia, Weibo in China, or before its 2014 Orkut in Brazil (http://blog.stcloudstate.edu/ims/2014/07/05/social-media-orkut-the-and-of-an-era/ seeks to create its own users’ momentum, and no differently from Facebook, expand that membership momentum from the host country to a global dominance (http://blog.stcloudstate.edu/ims/2017/08/06/psychology-of-social-networks/; more citation comes here). Based on the WeChat affinity of the Chinese students at the SCSU CI program, the program organizers faced difficulty applying other social media platforms, as part of the curricula of the host country. Namely, blog, as one of the widely used SM platform for creative writing (citation comes here), was contemplated as a SM platform for the Chinese students to journal their experience at the SCSU CI program. Since WeChat behaves rather like Facebook and Snapchat, the lack of opportunity to utilize widely available platform for rather lengthy narration (versus SMS/texting abilitis of Twitter and WeChat) convince the SCSU CI program organizers to seek the buy in by Chinese students into the blog initiative. Pang (2018) builds a theory based on Ellison (2007) theory of “maintained social capital,” namely the ability of individuals to maintain values of social ties when geographically disconnected. Ping (2018) further narrows her research on Chinese students in Germany using Li and Chen (2014) findings about Ellison’s theory on students in a foreign environment and the necessity for these students to build a new circle of friends in the host country. According to Basilisco an Cha (2015), such environment was provided for Filipino students by using Facebook and Twitter. The Most Favourable Mobile Messaging Apps among IIUM Students. (2012), 3(12), 6. Only 4 percent of African-American seniors nationally were proficient in sciences, compared with 27 percent of whites, according to the 2009 National Assessment of Educational Progress. GZA by bringing science into hip-hop; Dr. Emdin by bringing hip-hop into the science classroom. hip-hop “cypher,” participants stand in a circle and take turns rapping, often supporting or playing off one another’s rhymes. Fifteen states now require all high schools to offer computer science courses. Twenty-three states have created K-12 computer science standards. And 40 states plus the District of Columbia allow students to count computer science courses toward high school math or science graduation requirements. That’s up from 12 states in 2013, when Code.org launched, aiming to expand access to computer science in U.S. schools and increase participation among girls and underrepresented minorities in particular. Nevada is the only state so far to embed math, science, English language arts and social studies into its computer science standards. Roughly half of American school children have experienced at least some form of trauma — from neglect, to abuse, to violence. In response, educators often find themselves having to take on the role of counselors, supporting the emotional healing of their students, not just their academic growth. The condition has numerous names: secondary traumatic stress (STS), vicarious trauma, compassion fatigue. The symptoms are similar in some ways to post-traumatic stress disorder: withdrawing from friends and family; feeling unexplainably irritable or angry or numb; inability to focus; blaming others; feeling hopeless or isolated or guilty about not doing enough; struggling to concentrate; being unable to sleep; overeating or not eating enough; and continually and persistently worrying about students, when they’re at home and even in their sleep. One of the handful of studies of STS in schools found that more than 200 staff surveyed from across six schools reported very high levels of STS. STS can affect teachers’ happiness, health and professional practice. But Betsy McAlister Groves, a clinical social worker and former faculty member at the Harvard Graduate School of Education, says that she has often been surprised by the number of teachers, school counselors and administrators who recognized the cumulative stressors that they faced in their schools but did not realize that their symptoms were a common reaction to working with traumatized children — and that these symptoms had a name. Trauma-Informed Schools: School leaders should take a school-wide approach. There is a growing movement around creating trauma-informed schools — schools that recognize and are prepared to support community members affected by trauma and traumatic stress. Such schools deeply integrate social-emotional learning into their teaching, culture and approach, understanding that the holistic health and wellbeing of their charges is essential for achieving academic success. Assess how your work as an educator might be affecting you (both positively and negatively) by using the Professional Quality of Life (ProQOL) self-assessment tool and exploring the toolkit created by Teaching Tolerance to learn self-care strategies. Learn how, as an educator, you can begin to identify secondary traumatic stress and learn strategies for self care through the tip sheet created by the National Child Traumatic Stress Network. Explore the resources created by the Trauma and Learning Policy Initiative, a collaboration between the Massachusetts Advocates for Children and the Harvard Law School. How strong are your school’s trauma-responsive programs and policies? Take the 20-minute evidence-informed Trauma Responsive Schools Implementation Assessment to find out — and learn ways to grow your school’s work. Learn about additional individual and organization strategies for addressing secondary traumatic stress, compiled by the U.S. Department of Health and Human Services. Stay tuned for a new online curriculum for preK–12 teachers, named STAT (Support for Teachers Affected by Trauma), being created by experts in the fields of secondary traumatic stress, education, and technology. The curriculum, due for a 2019 launch, will feature five modules on risk factors, the impact of STS, and self-assessment, among related topics. “The idea behind us using Slack [last fall] was to kill internal email,” says Green. That’s a common refrain in pro-Slack headlines, with good reason. Users can drop links and files into any Slack conversation. documented here how educators use Trello to manage project-based learning activities that involve group work and peer review. Slack has been described as “ a private Twitter on steroids.” At first glance, the tool looks like a chat room—but it’s got more going on inside. Like Twitter, Slack features hashtags that denote specific “channels” dedicated to topics, but each channel operates like its own chat room. Users can send messages to a channel or directly to one another (one-to-one), and also create private groups for focused discussions (one-to-few). Other educators are exploring how to use Slack as a professional learning network.